La Push, WA. It looked like the end of the earth, if not the end of the world. Finisterre means “the end of the earth”. This town in Galicia, perched on a rocky outcropping, overlooks a seemingly eternal ocean. To explorers, it must have seemed like the end of terra firma, and it marked the terminus of my pilgrimage along El Camino de Santiago in Spain. At the Finisterre lighthouse, pilgrims burn a personal item from The Way to mark its completion. On my road trip, I found what felt like Finisterre in the middle of the journey, about 1,500 miles from Colorado. After checking into the Far West Hotel in Forks, Washington, I had an urge to drive to the coastal town of La Push, imagining I’d take a sunset walk along the beach. Shortly after leaving Forks, still warm under a strong sun, and turning left toward the ocean, a thick mist blanketed La Push Road. Metal signs posted along the pavement indicated I had entered a tsunami evacuation area. It was as if I had crossed a threshhold to another world, one vulnerable to the elements and shrouded in mystery, close in distance but distant in sensibility from the interior of the Washington Peninsula. In the 15 mile drive, the temperature plummeted 20 degrees. Another metal sign, blue with white letters and posted on a corner, read smoked salmon, with an arrow pointing to the right. Beneath it, propped against the pole, rested a large hand painted board, black letters shouting against a yellow background: fresh smoked fish. And, in red marker, #361. Salivating, I turned right to follow the arrow. Suddenly I was in a neighborhood where children’s toys and furniture lay scattered in the yards in front of ranch homes, as if the boxy dwellings weren’t large enough to contain the life within. A few dark haired girls played in the back of a pickup truck, laughing, seemingly immune to the thickening fog. It took me a moment to realize I was on a reservation, that of the Quileute Nation. By now it was close to 7pm, and I wondered if whoever was selling the smoked fish was done for the day. Inching along the street, I spotted even larger signs. Large white letters against a blood red background read: Mmm…fish. An arrow pointed to the right. I pulled up in front of a long single story home, its vertical slats a faded maroon, 361 scrawled in white upon it in three places, so there’d be no mistake. Lanterns, buoys and even more signs (Open, in orange paint) festooned a cluster of trees at the end of a driveway. I got out of my car and approached the house. A stout woman with short curly hair and a long scowl opened the door. She stuck her head out. Her body remained inside. “Do you have any smoked fish?” My voice wavered, as if it knew I was an interloper. Perhaps it would have been better if no one had been home after all. She retreated into the darkness and returned with sealed packages, each containing two thick pieces of smoked salmon. “$25 each,” she said. I raised my eyebrows and looked into my wallet. I only had twenties. I pulled out two. “Do you have change?” She shook her head. “I’ll take $20,” she said, in a tone that suggested she was eager to be done with it. She reached her hand toward mine. I took a package of fish and handed her a bill. She vanished inside. The door clicked behind her. I continued to the coast. The mist had thickened, saturating the air with droplets. I put on a windbreaker and stared at the sparse beach. Shadowy mounds rose from the sea, like ancient sentries bearing witness to the follies of humankind. A single thick trunk, stripped smooth and grey by the elements, lay on its side like a fallen totem. 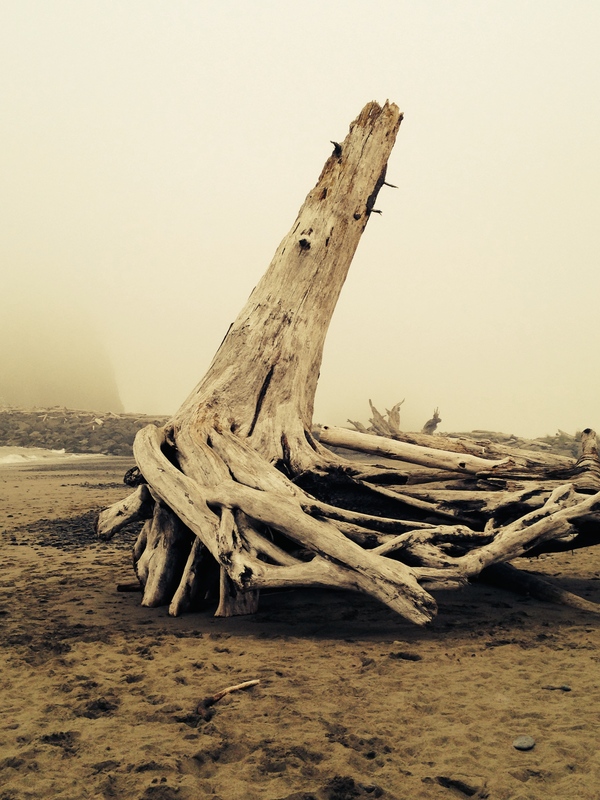 Other pieces of driftwood, jumbled together, evoked a large pile of bones. Another grey trunk, perched on desiccated roots, appeared to keen over the devastation, as if it were mourning the Quileute ancestors lost both to the ocean and to the caucasian conquerors. A wave of emotion overwhelmed me and I started to cry. Was I weeping at the senselessness of human violence, or at the triviality of my experiments with creating uncertainty? What was I really risking? Anything? I walked further along the beach, strewn with even more defunct trees. Voices and smoke wafted towards me as my feet sank into the sand and its damp grit invaded my sandals. A bit inland, small groups of people huddled by fires. I couldn’t tell if they were warming themselves by choice or necessity, but the clammy and acrid air and the monochrome landscape made it seem as if I were previewing the apocalypse, the end of the world at the end of the earth.